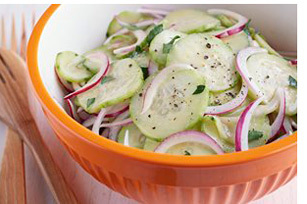 Thinly sliced cucumbers and red onions are tossed in a tangy mustard dressing for a refreshing side-dish salad. Mix dressing, mustard, parsley and sugar until blended. Substitute fresh dill for the parsley.